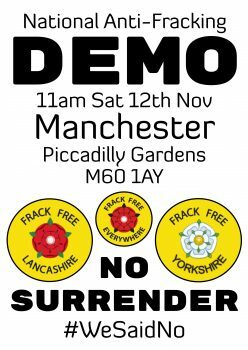 Frack Free Lancashire is holding a massive, family-friendly, NATIONAL anti-fracking rally on the 12th November in Manchester. The United Against Fracking rally is supported by the TUC, and will consist of a march, guest speakers, music and much more, with more details to follow. We need to show the government and the oil and gas industry just how strong the opposition is against fracking. Groups from all over the country, including Scotland, Wales and Ireland, shall be joining the rally. The rally shall start at 11am (Piccadilly Gardens) and finish at 5pm (Manchester Cathedral Gardens). For more details regarding the event, including travel arrangements, the cost of joining the rally and further updates, you can visit the Facebook event page or you can click here. If you are interested, you can book your place by emailing: fflancashire@gmail.com.